I must say, writing this blog can be quite rewarding. I have met many people and have made many new friends. I have learnt new things and I have passed my knowledge on to others as well. The fact that anyone reads this is pretty much a bonus! I always say that as a true blue Malaysian, I can’t help but talk about food all the time. I love it. Eating is such a big part of my upbringing. My entire life revolves around food. This August, there will be an extra special focus in featuring Malaysian restaurants. Why? I’ve been chosen as one of 13 lucky food bloggers around Australia to review a Malaysian restaurant once a week. The prize? The three bloggers with the highest number of votes will win a trip to Malaysia for the ultimate food tour! For this first post, I thought I would actually invite some of my work colleagues to join me for dinner at a Malaysian restaurant based in the CBD area. But due to heavy workloads and family commitments, only Sconnie could make it. And that was perfect. I’ve been educating her on all things Malaysian and have actually managed to convince her to have her honeymoon in Malaysia!! She’ll be visiting Kuala Lumpur, Langkawi and Sabah come October and by hook or by crook, I’ll have her comfortably knowledgeable when it comes to dining out in Malaysia! So, what better way to start her on her holiday training than by feeding her Malaysian food? 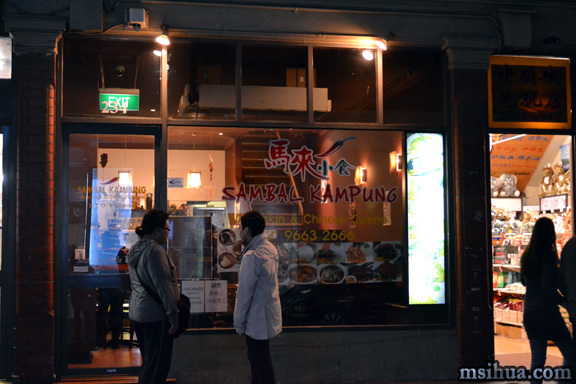 The restaurant I chose was aptly named Sambal Kampung. Apt because nearly every dish had sambal in it. Poor Sconnie was going to be in for a fun night! She’s not very comfortable with chilli at all. However, she loves wasabi! 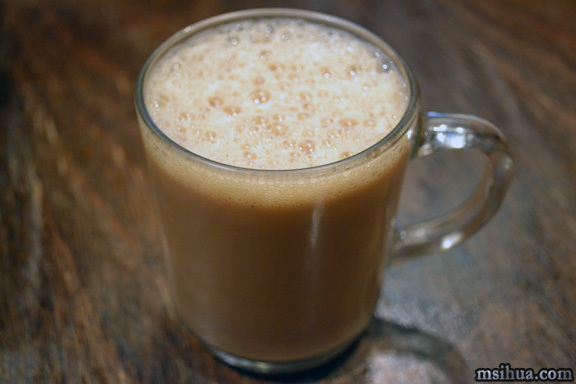 To start, I ordered us Teh Tarik and mentioned that this was Malaysia’s official national drink.The Teh Tarik (pulled tea; $3) which we had arrived beautifully frothy and upon sipping it, we discovered that it was quite sweet. Not as sweet as I’ve had in some mamak stalls, but sweet all the same. 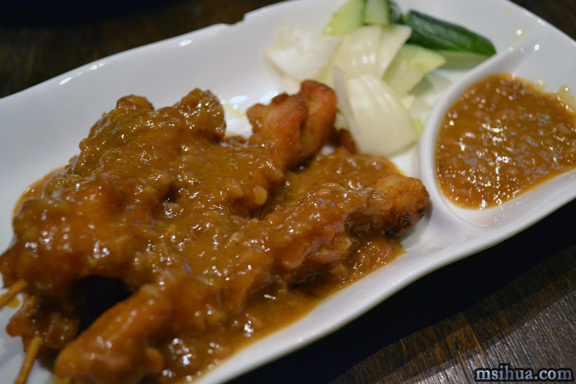 For our entrée, we ordered the Satay Ayam (Chicken Satay; $6.50) which arrived drenched in a beautiful peanut sauce. The chicken was really tender but I felt that the kuah (sauce) could have been a little spicier. I was a tad disappointed that the ketupat (compressed rice cakes) were missing from this dish to complete the whole satay experience. That being said, the satay was our highlight dish of the night. So good! I thought I’d give Sconnie a chance to taste a variety of dishes and show her the different options she could have when she goes to Malaysia. So I ordered a couple of dishes to have with rice. We had the Deep Fried Salt and Pepper Calamari ($21.00), which we both quite enjoyed but felt that the batter could have been lighter and crispier. 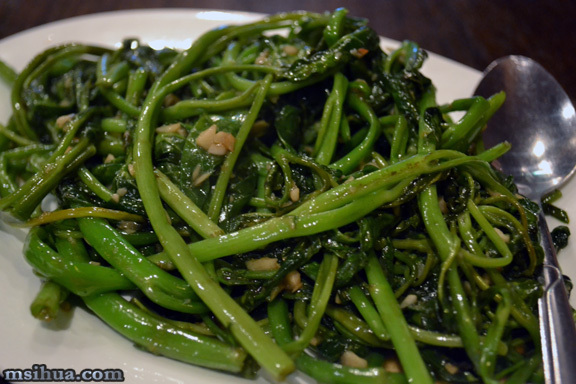 Next, we had the Stir Fried Kang Kong (water convolvulus) with Garlic ($19.00). If I were dining on my own, I would usually order the Sambal version of this dish. However aware that my guest couldn’t handle the heat, I ordered the garlic version of this. I just loved how crunchy and delicious the kang kong was. 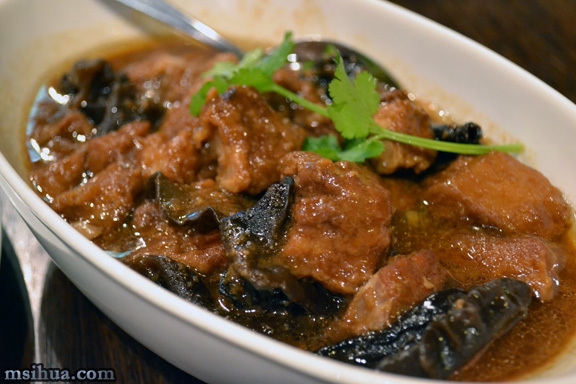 We also ordered the Hakka Pork (Kiu Nyuk) ($19.00) dish to try. I was really keen to try this dish as not many places have Hakka dishes. Originating from the southern province of China, there was a large influx of Hakka people to Malaysia during the 19th century where they settled down to work at the tin mines. Now, they happen to be the second largest Chinese sub-ethnic group in Malaysia. This braised pork belly dish is usually accompanied by yam and mustard greens. 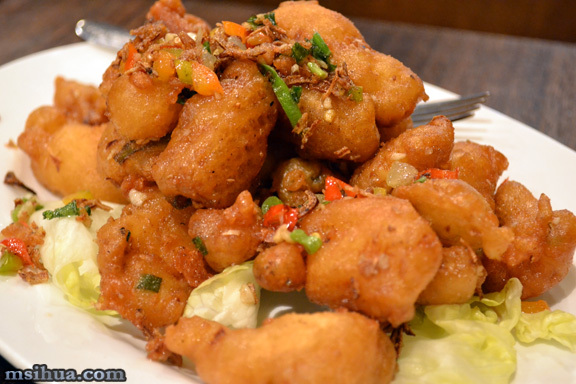 The Sambal Kampung version had cloud ear fungus instead, which I quite like as well. Upon first tasting it, Sconnie thought that it was quite rich and heavy. But as time went on and she tried the other dishes, she kept coming back to this braised pork belly dish for more. 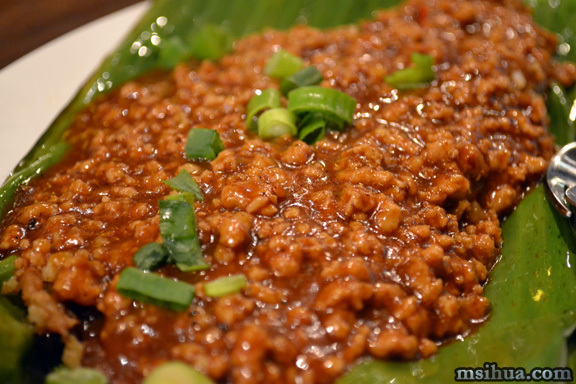 To finish our epic feast off, we ordered the Spicy Rockling with Belachan and Minced Pork ($22.00). I wasn’t quite expecting this dish to turn up entirely covered by minced pork. It somehow overpowered the freshness of the fish beneath it. What did I think of the overall meal? I thought it was pretty decent. Not everything was a 100%, but it did have its shining moments with its Satay and the Hakka Pork which were pretty authentic and delicious. Would I return? Yes, I will. 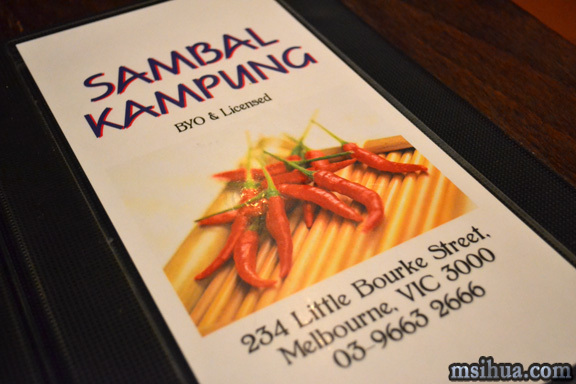 I’m making my next visit a fun-filled chilli experience with every dish having sambal in it. But the Boy might just collapse (pssst… he’s not a fan of spicy food either)! Bonus points: Because we had so much leftover food, we took it back to the office for our lunch the next day. Sconnie and I dined in glee surrounded by the constant “Ooohs” and “Aaahs” from jealous work colleagues 🙂 WIN! Take me next time lady! I can always handle sambal heat (or heat of any kind!) Also, I just got a “fatal error” message when I tried to get to the voting website, but rest assured I’ll keep trying!! So so so so hope you win! Haha that is so frustrating – do you know I have never entered this restaurant for the pure reason that everytime I walk by it is empty or only has non-Asians, which I always think is never a good sign for an Asian restaurant!! Clearly I shouldn’t be so racist 😉 And I don’t mind that kind of calamari batter! The seafood place we go to in Selayang back in Malaysia does something similar. Such nostalgia! Congratulations! You truly deserve it, I mean your posts have been delightful to read. Anyhoo, these Malaysian dishes are truly amazing! I haven’t tried any Malay cuisine but I would love to try out some soon. Like your friend Scoonie, I’m not a fan of anything spicy, well, not anymore but I can take it if it’s that delicious! hahaha. So, do you have any suggestion, you know, for starters? Oh I can’t stand wasabi too! It’s interesting that Scoonie doesn’t like anything chili but loves wasabi. Well, just sayin’. Hi there! And thank you!!! Hmmm.. I’d probably start with the basics.. roti canai, nasi lemak, laksa, just basic hawker food.. then when you’re comfortable with the richness of the food, you can spice it up! I saw this on Tuesday whilst pacing along the streets of the city. Somewhat sounds a little Indonesian, until I read the sign carefully. 19dlrs for kangkong!! I do miss them and usually eat them once a year, but not for 19 dlrs! Hahaha. Not sure who else to like on the list. Took me ages to find the like button, gotta press the red 01 first huh? Hope you get the win and have a little extra cash saved on the home ticket ay. Lols… why not? YOU could start a club over in the NZ 🙂 That is true.. the prices were a bit steep! Not been yet. Oh guess what I brought back DIY ketupat! It is so damn weird. not tried it yet. Great job on your post! Sadly I couldn’t participate with the timing but it sounds like lots of fun. I’m crossing my fingers for you! What a terrible challenge to eat great food and blog about it 🙂 I love Malaysian food and spices too. Our holiday is postponed AGAIN, but next year we’re getting to Malaysia for sure! Oh no!! Why is it postponed again? You have to go… it is definitely a food Mecca!